Find a NOS exhaust. Virtually none are left. Expect to megabucks if you do find one. I recently sold the last one I had. I don’t expect to find any more. These have been fetching $2,000+ in a few cases! MAC – Beware of issues with chrome plating. 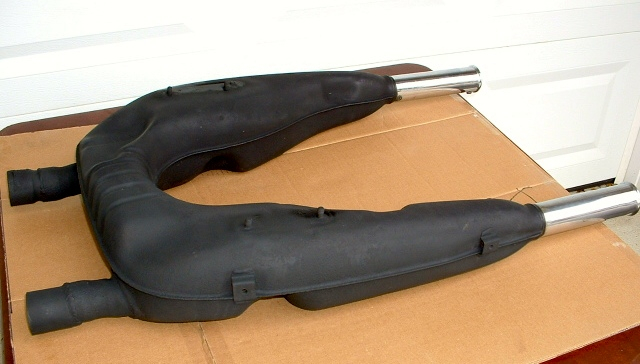 Fit new Harley “take-off” mufflers available cheap at any Harley shop. Late model Sportser mufflers work well but you will need some minor fabrication skill. See: http://www.ngwclub.com/forum/viewtopic.php?t=12934 Free registration may be required to view. NOS Kerker 4-into-1. I recently sold my last set of these. There are very few of these systems left. Note: Most aftermarket exhaust systems will actually reduce performance relative to the excellent OEM exhaust system which is superior in terms of flow and scavaging characteristics. More noise does not equal more power! Usually, no re-jetting is required when the exhaust system is changed. These bikes will tolerate most any exhaust system without complaint. However, they are very sensitive to changes on the intake side. For example, K&N air filters are not recommended. I have 2 sets of K3 mufflers. I am planning to sell them on ebay. How much should I list them for? I bought 4into2, will mount in a week. Send pix to akarandakk@gmail.com please. Thanks.